"As I look down on my homeland of Ithaca, California, with its cactus, vineyards and orchards, I see that so much of me is still living there - in the places I've been, in the fields and streets and church and most of all in my home, where my hopes, my dreams, my ambitions still live in the daily life of my loved ones." A heartwarming (and at times overtly maudlin!) 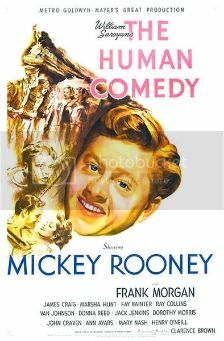 portrait of the home front during World War II, The Human Comedy boasts some strong performances, especially from Mickey “Andy Hardy” Rooney and Frank “Wizard of Oz” Morgan. Rooney portrays “Homer Macauley," a high school student in fictional “Ithaca,” California working part-time as a telegram delivery boy, while Morgan plays “Willie Grogan,” the booze-swilling telegraph operator. The supporting cast includes Van Johnson, Donna Reed, Ray Collins, Fay Bainter, James Craig, Marsha Hunt and Jackie “Butch” Jenkins (as “Ulysses,” best remembered waving at the passing train during the opening scene). Also look for Carl “Alfalfa” Switzer as “Auggie,” one of the kids who “steals” the apricots from the old codger's yard. Produced by MGM and directed by Clarence Brown (Ah, Wilderness), The Human Comedy was reportedly Louis B. Mayer’s favorite film. William Saroyan wrote a lengthy script, which was rewritten by Howard Estabrook at the instigation of Mayer. An extremely upset Saroyan got revenge by turning the screenplay into a bestselling novel. The film went on to receive an Oscar for “Best Story.” It was also nominated for Best Actor (Rooney), Best Cinematography, Best Director and Best Picture (losing out to Casablanca). Useless Trivia: Robert Mitchum appears briefly in an uncredited role as one of the soldiers on leave.